TAMPA, Fla. — The most prominent Asian American elected official to address the Republican National Convention was South Carolina Gov. 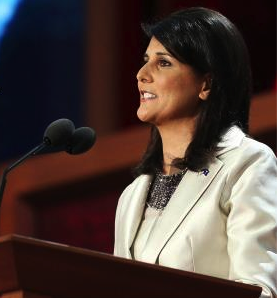 Nikki Haley, who is regarded as a rising star in the GOP. Louisiana Gov. Bobby Jindal — who, like Haley, is of Indian descent — was also scheduled to speak, but did not attend the convention because Tropical Storm Isaac was threatening his state. Haley gave her speech on Aug. 28. Following are her remarks, as prepared for delivery. They loved the fact that only in America, we could be as successful as we wanted to be and nothing would stand in our way. My parents started a business out of the living room of our home and, 30-plus years later, it was a multimillion-dollar company. But there wasn’t a single day that was easy and there wasn’t a single day my mom and dad didn’t put everything they had into making that business a success. So, President Obama, with all due respect, don’t tell me that my parents didn’t build their business. Almost 45 years after my parents first became Americans, I stand before you and them tonight as the proud governor of the state of South Carolina. We build things in the Palmetto State. We build planes. We build cars. We have three of the four largest tire producers in the world and are about to become the number one tire-producing state in the country. And not too long ago, The Wall Street Journal said, “Anyone still thinking the U.S. has lost its manufacturing chops hasn’t been to South Carolina.” We have so much potential and so much to be proud of. But like so many states, we have our challenges, whether they be unemployment or education or poverty. And like so many of my fellow governors, I work day in and day out to try and improve the lives of the people of my state. And, sadly, the hardest part of my job continues to be this federal government, this administration, this president. As I said, my parents loved that when they came to America, if you worked hard, the only things that could stop you were the limits you placed on yourself. Unfortunately, these past few years, you can work hard, try to be as successful as possible, follow the rules, and President Barack Obama will do everything he can to stand in your way. South Carolina recently passed one of the most innovative illegal immigration laws in the country. What did this president — who has failed to secure our borders and address this issue in any meaningful way — do? He sued us. If this president refuses to secure our borders, refuses to protect our citizens from the dangers of illegal immigration, then states have an obligation to take it on ourselves. We said in South Carolina that if you have to show a picture ID to buy Sudafed and you have to show a picture ID to set foot on an airplane, then you should have to show a picture ID to protect one of the most valuable, most central, most sacred rights we are blessed with in America — the right to vote. And what happened? President Obama stopped us. And now we come to the most unbelievable of them all. In 2009, South Carolina was blessed to welcome a great American company that chose to stay in our country to continue to do business. That company was Boeing. Boeing started a new line for their 787 Dreamliner, creating 1,000 new jobs in South Carolina, giving our state a shot in the arm when we truly needed it. At the same time, they expanded their job numbers in Washington state by 2,000. Not a single person was hurt by their decision. Not one. And what did President Obama and his National Labor Relations Board do? They sued this iconic American company. It was shameful. And not worthy of the promise of America. But we did one of the things we do best in South Carolina — we got loud. We’re fighters in South Carolina, and as we fought we watched an amazing thing happen: you fought with us. A few months ago, I sat on the tarmac at the Boeing facility in North Charleston and watched as a brand-new mac daddy plane rolled onto the runway sporting a “Made With Pride in South Carolina” decal and surrounded by 6,000 non-union employees, cheering, smiling and so proud of what they had built. We deserve a president who won’t sacrifice American jobs and American workers to pacify the bullying union bosses he counts as political allies. Slighting American ingenuity and innovation, that’s what this president has meant to South Carolina. That’s what this president has meant to this governor. And that’s why this governor will not stop fighting until we send him home, back to Chicago, and send Mitt and Ann Romney to 1600 Pennsylvania Avenue. I have had the pleasure of knowing Mitt Romney for several years now. There’s so much to appreciate about him. He fixes things. He’s results-driven. He’s taken broken companies and made them successful. He took a failing Olympics and made it a source of pride for our country. He went into a Democratic state, cut taxes, brought in jobs and improved education. Oh, and by the way, he actually balanced his budget. This is a man at peace with who he is, with the challenges he faces, and with what he intends to accomplish. This is a man who is not just a candidate looking to win an election, but a leader yearning to return our nation to its greatest potential. And this is a man who has a silver bullet, his greatest asset, by far, the next first lady of the United States, Ann Romney. Ann is the perfect combination of strength and grace. She does what so many women in America do — she balances, in an exceptional way. She raised five amazing boys, battled MS, is a breast cancer survivor, and through it all was a true partner to Mitt at every turn. Ann Romney makes all women proud by the way she has conducted her life as a strong woman of faith, as a mother, as a wife and as a true patriot. She is an amazing inspiration for me and for so many women across this country. They are so right. We deserve a president who will turn our economy around. We deserve a president who will balance our budget. We deserve a president who will reform and protect our retirement programs for future generations. We deserve a president who will fight for American companies, not against them. We deserve a president who will strengthen and support our military, not destabilize them. America deserves better than what we have today. We deserve a President Mitt Romney. Thank you, God bless you, and may He continue to bless the United States of America.